13 Life beliefs that destroy self-confidence. Are your beliefs about life undermining your self-confidence? The beliefs you have about things have a powerful impact on what you feel and what happens. Believe you can’t do some things and the odds are you won’t be able to do them. Most people have a few unhelpful beliefs about life. Those beliefs create the feelings you have when you encounter an obstacle in life. Feelings result in doing or not doing things. The wrong beliefs can destroy your self-confidence and turn a possible success into a dire failure. How many of these self-confidence destroying beliefs are you holding onto? 1. You need to be better than others to be OK. The belief that others are allowed to make mistakes but you will need to be perfect to be acceptable results in low self-esteem, reduced confidence in your abilities and ultimately undermines your efforts to do things that could create a better life. Do you always compare up? Come in second in the Olympics and you could easily compare yourself to the person who is first. That you had to beat hundreds, thousands, of other competitors to reach this level in the first place is something you lose sight of. 2. You need to obsess about what others think and do. Other people’s opinions, particularly about you, are none of your business. Staying focused on others takes the focus off what you are doing. Concentrate on being the best person you can be. Take your game to the next level and you will find that where others are, does not matter. 3. You need attention to feel good about yourself? Attention, like popularity, is fleeting. You have it one moment and the next it is gone. People who feel good about themselves work for their own approval not the applause of others. Like what you do and then the applause is a bonus, not the whole salary you will reserve for what you do. 4. Doing things for others means they are taking advantage of you. If you feel taken advantage of stop doing that. Do good because it feels good to help others. If you do for others expecting their gratitude and thanks you will always end up feeling cheated. Do good because it makes you feel good to do it and no one can’t take that reward away from you. 5. Your accomplishments don’t matter. Discounting your accomplishments tosses your self-confidence away. When you do something well do you tell yourself and others that it was no big deal? Do you think to yourself you should have done more, done it better and faster? Discounting your own accomplishments always leaves you short on the self-confidence end. It is OK to accept compliments. Dismissing them devalues the person who has paid you that compliment. Accept compliments graciously and give yourself acknowledgment for things well done. The person you most need to have notice when you have done something well is you. 6. Everyone is your enemy. Do you think people are against you? The belief that everyone is out to get you is guaranteed to destroy your self-confidence. What you are probably missing is that you are really not that important to others. They are mostly thinking about themselves. The only time’s people are jealous of you or out to get you is when you are way out front doing everything better than they are, or when you step on their toes in the process. If you do well there will be people who criticize you. If no one says anything bad about you then you probably haven’t done much. 7. Everything you do is deadly serious. Do you take yourself too seriously? Taking yourself too seriously magnifies your errors and minimizes your successes. Learn to enjoy life. Remember no one gets out of this alive so you can be miserable or you can enjoy the journey. The choice is up to you. 8. You can’t admit you made a mistake. Accept that you are less than perfect. Trying to pretend that you never make a mistake takes its toll. If you say that you are lying. If you believe you never make a mistake you are lying to yourself. Get honest and accept that you, like everyone else, will miss a few things. 9. You need to control everything to be safe. Are you trying to control the uncontrollable? Those who believe in God will tell you that you are trying to do God’s job. Some things are in your control and others are not. Not sure about that? Think if you tried harder you should be able to keep everything under control. Try making it rain exactly an inch a day. Did you get it right today? Ever try to teach a cat to bark or a dog to purr? How successful were you at that? You will not be able to control your children, eventually, they escape. Your partner will resent you trying to control them and it will damage your relationship. Most things in life are out of your control. The only thing you really can control is your attitude as you set out each day to do what is in your control. 10. You shouldn’t have to praise people for just doing what they are supposed to do. Does it pain you to praise others? If you find it hard to see the good in others, if you can’t praise them for what they have accomplished, then you will find praise for your efforts wanting. Never tell a child they ever did anything right, point out all their mistakes and eventually, that child will learn to be helpless and will give up trying to please you. Has no one ever praised you? Did you give up somewhere along the way? 11. You expect others to let you down. You avoid working with others. Expecting others to let you down and not offering them the opportunity creates what you fear. Yes, some people will let you down. They are not perfect. Neither are you. Even when you try your hardest you will let others down some of the time. Humans are social animals. We need other people. Let others be who they are and you will get the freedom to do likewise. Yes, there are people you should avoid and dangerous places. Avoid them if you can and if you can’t exercise caution. But isolating does not result in self-confidence. 12. You don’t think you are any good. If you don’t like you this is sure to undermining your self-confidence. Work on liking, loving you. Give yourself encouragement. Seek out the things you do well. Get to know yourself. If liking yourself is a challenge, work with a counselor and try to search for your good points. 13. Without others, you will be lonely. If when you are alone you feel lonely you have not yet made a friend of yourself. Some people are more introverted. Others are more extroverted. Healthy people, introverts or extroverts, need some time alone and some time with others. Get your life in balance. Learn to enjoy your time alone and your time with others. The cure for low self-confidence? Work on these unhelpful beliefs. Learn and practice new helpful beliefs. Do more things and better things and give yourself love and encouragement even if no one else does. Read books on wellness and recovery and positive psychology. Especial look at books based on Cognitive Behavioral Therapies. Work with a counselor, therapist or life coach. 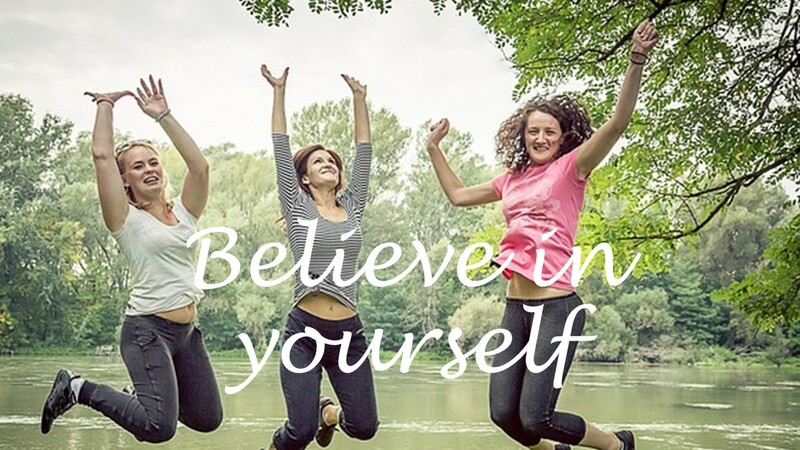 You can change your beliefs, raise your self-confidence and feel good about yourself. This entry was posted in Life Coaching and tagged creating low self-esteem, destroying self-confidence, increasing self-esteem, self-defeating thoughts, Unhelpful thoughts by David Joel Miller. Bookmark the permalink.